This is the first half of a tutorial which shows how to create a speedometer in Excel. The model is essentially a 2D scatter chart having as background the picture of a speedometer dial downloaded from www.flickr.com. Before using the photograph you need to erase the arm of the speedometer from the picture using Photoshop or other photo editing software. In the model I replaced the deleted arm with a moving arm created from a chart line. The tutorial will not show you how to use Photoshop but it will casually introduce you to a free Photoshop substitute called Gimp and demonstrate how to do the aforementioned image alterations. 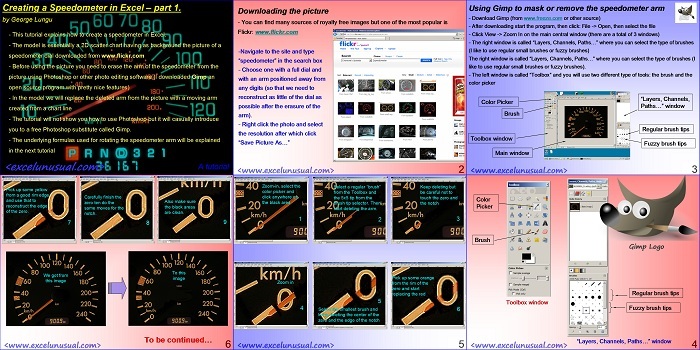 The second half of the tutorial (in the next post) will explain how to insert the dial photo in the chart and the formulas used to drive the speedometer arm. If somebody knows photodhop, the model can be customized to their tastes. George, I want to know if you are providing Photoshop tutorials as well ?